This character 2 double bedroom end of terrace house is situated in a popular residential road with a good size kitchen/diner. 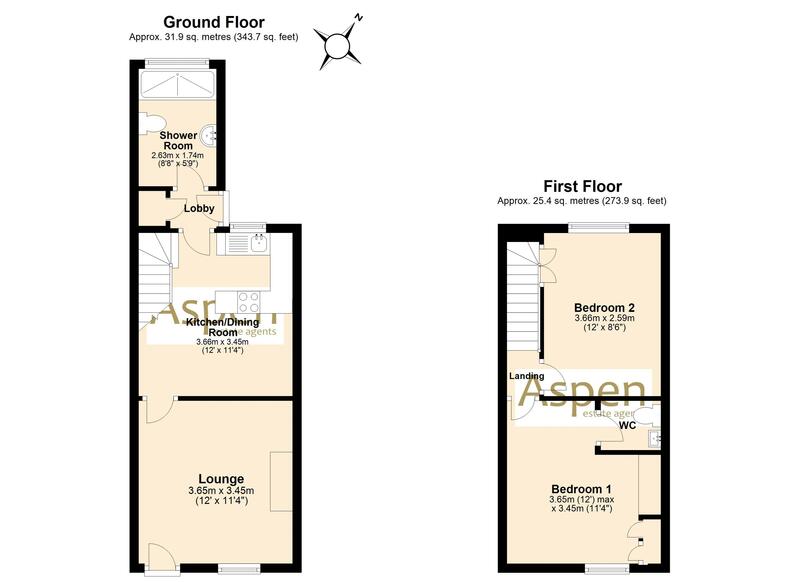 There is a living room at the front and a lovely shower room downstairs with large shower enclosure, whilst the main bedroom has an en suite cloakroom. There is gas central heating to radiators, double glazed windows and the 55' South/Westerly aspect garden has an excellent size brick built store shed. Whilst the property has been well maintained there is still scope to make it your own. There is no onward chain. EPC Rating: D.
Double glazed window and front door, radiator and modern gas coal effect fire. Range of eye and base level units with inset stainless steel single drainer sink unit with mixer tap, part tiled walls, space for cooker, washing machine and refrigerator/freezer. There is a radiator, double glazed window to the rear, recessed ceiling spot lights and stairs to the first floor. Frosted double glazed door to the side/rear garden, ceiling light point, cupboard housing gas central heating/hot water timer/programmer unit and shelving. Re-fitted in 2007 this white suite has a large walk-in shower enclosure with rainwater shower head as well as a hand held shower. There is a low level w.c. pedestal wash hand basin with chrome mono bloc tap, frosted double glazed window to the rear, recessed ceiling spotlights, tiled floor and walls, radiator. smoke alarm, ceiling light point, access to loft space. Double glazed window to the front, fitted cupboard, radiator. Done in 2012 this white suite has a low level w.c. wall mounted wash hand basin with chrome mixer tap, tiled walls to approximately half height and a ceiling light point. Double glazed window to the rear, radiator, ceiling light point, built in cupboard. Mainly laid to paving with large flower/shrubbery beds and fenced. There is a light and tap and a gate for pedestrian access from the middle house to the front where there is a further light. At the bottom of the garden is a large store shed with light & power, telephone point and a window.